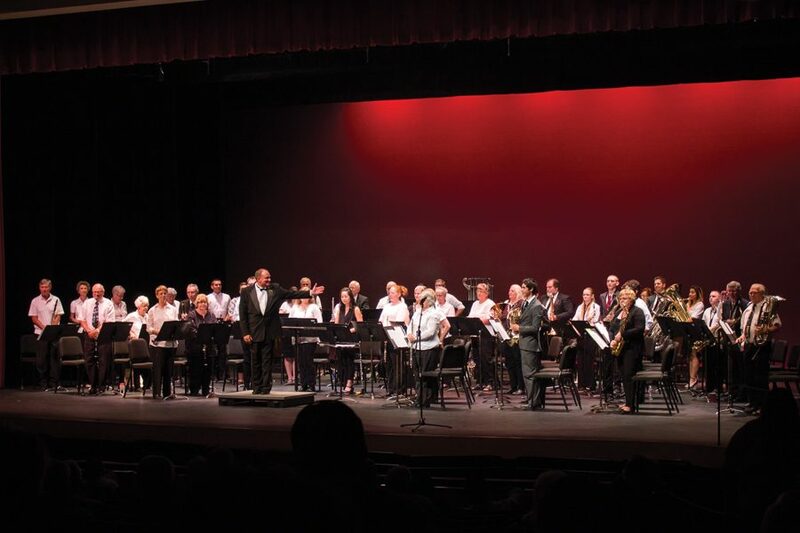 With the end of the semester quickly approaching, Central Arizona College’s own Community Wind Ensemble performed what they have been rehearsing all semester. April 21st was a night for music at CAC’s Pence Center. Not only did CAC’s Wind Ensemble get to play but the Florence High School Concert Band also got a chance share the stage for the evening. A Festive Occasion was the theme of the concert. The Florence High School band performed first. They opened with Amparito Roca by Jaime Texidor and arranged by Aubrey Winter, then Shenandoah by Frank Ticheli, followed by The Liberty Bell March by John Philip Sousa, and finally Highbridge Excursions by Mark Williams. After The Florence High School band, an intermission allowed CAC’s Wind Ensemble to tune their instruments and get to their chairs. Their opening song, Olympic Fanfare and Theme by John Williams and arranged by Jim Curnow, was the center of the concert theme. The song was for festive celebrations as Director Rick Moore put it and he decided that A Festive Occasion should be the theme of the concert this semester. Their next song was Thus Do You Fare, My Jesus by Alfred Reed. After that, they played Derby Day by Hugh M. Stuart. Before the next song, Director Moore introduced Laura Wolfe, a flutist in the CAC band, as a guest conductor continuing their new tradition of allowing music educators the chance to conduct a song for the very band they play in. She went on to conduct Adirondack Festival Overture by Stephen Bulla. Next, they played Free Lance March by John Philip Sousa and finally Havendance by David Holsinger. In between songs Director Moore would mention how the band felt like a family. After meeting every Tuesday night for the entire semester, the members would get to know each other. One thing that Director Moore was proud of was the fact that they have actual families playing together. Different generations of the same family all participated in the same band and had the chance to play music together. At the end of the concert, Director Moore presented Mason White, a trombone player in the band, the Ron Bowen Award. The Ron Bowen Award started at CAC in 2002 and given to band members that have shown dedication to contributing to the Wind Ensemble. Moore mentioned that White has shown passion for the band in the past few years he’s been in it, even though music was not his major. The Florence High School band and CAC’s Community Wind Ensemble did a great job in both of their performances. The night was a great chance to enjoy some festive music.